I think I said maybe I'd write about it more. I just read this, jotted in the middle of the night on my phone about a week after I put her to sleep. I considered posting it on Facebook, since so many friends were so involved, present for so many things in her life. Not sure if I'll do that though. The other day I wrote a much longer thing related, similar post. Maybe I'll replace this,or post it, I don't know. Death is so weird. Odd. unexpected. I've always been agnostic about God and heaven. My mother was sure in her non-belief. I remember those last breaths. In..out. Pause. In...out. Pause. Pause. In....out. and gone. Stella's sedation...I think it help her body start to really let go. She was antsy in *the room. * But she arranged her blanket the way she wanted, and settled in on it. She got kind of shaky as the sedation really settled in. Enough for me to call the doctor with concern. She check and could see she was under. Told me she was going to do it and gave her the last shot. I could barely see her last breath, couldn't hear it after all those days of her working so hard for it, barely see that last breath from that swollen belly. Barely at all. Her heart kept beating for just a little bit longer and then it didn't. The whole time I just kind of spooned up to her, rubber her ears and her head and talking softly to her, what a good girl she was. I don't think I had time to tell her it was okay to go, to rest. But she did. And she was just quiet. I kept rubbing head, and talked to her, petting her shoulder, and paws. Somehow something changed. Maybe her paws started getting cold, that was when I had to go. I don't know why I kept talking to her, petting her. Maybe I hoped there was just a little of her left to hear me, sense me. After I delivered the boys, dissociative, I was told they were both born dead. Records later showed Jacob had a heartbeat, briefly, whatever that means. I felt awful that he died alone. Even if he wasn't conscious or developed enough to be conscious. If I couldn't be there, someone should have been, gently, tending. A witness to this last heartbeats. I still don't know time of delivery and death exactly due to the recording bring screwed up. Afterward, I wanted to see them, say goodbye, as if I'd be there at the time. I asked them to bring up the boys. Then, almost hysterical, I changed my mind. I couldn't bear holding them cold, especially from the morgue. And besides, I told myself, they weren't really there anyway, my boys, themselves were gone. Even as she had settled down on her blanket, Stella began getting quiet. She'd been concerned: it wasn't the regular type of room and no treats on the trip or while waiting. And we had to wait a little since they squeezed us in. She couldn't decide if she wanted water. But she made things as comfortable as she could with her blanket. Next to me. When she passed it was almost like she was sleeping, but not quite. She was always a snoozy girl, and even when she breathed easy you could hear and see it. To me, that was peace for her. Just resting, comfy, no worries. The scent of corn chips often wafting from her feet. I got one last whiff of it a few days before I brought her in. Or maybe it was a week. Time shifts around death. After Stella was gone, I told folks it was "heartbreaking, but peaceful." And yes, no more worries, working to breathe, no trying to please me with that tail going up when I called her name. And there was no panic or fear in the room as her breath and heartbeat stopped, just one of our comfy snuggles, and then quiet. Stopped beating at about 5:05 pm on Friday, August 18, 2017. She was about 12 years old. I didn't feel it stop; the vet did but she went sleeping, spooned against me, as I petted her silky ears, gently rubbed her face. 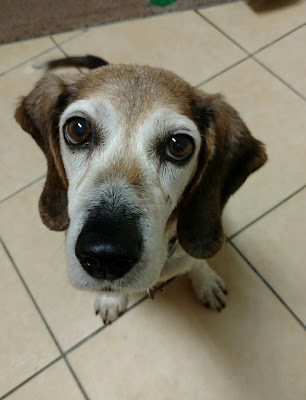 I hope to be posting something more about her, but since I shared her entrance into my life nine years ago, https://sodearandyetsofar.blogspot.com/2008/11/im-doing-okay.html , I thought I'd share news of her passing away from it. She started out sad and often apprehensive, but her spirit grew and it was a privilege to watch. Despite the many physical challenges Stella faced over her life, she stayed trusting and cooperative. Never did a tooth touch skin -- canine, civilian, or medical. The overarching adjective for her from stranger to friend to veterinarian was "sweet." She was a good girl, no matter what she got into, tore up, or ate. She was there for me when I needed her. She was a good girl, heart and soul. And I loved her. Okay, technical difficulties -- working from my phone. I'll post the others soon, maybe. In the meantime, here's one of my favorites, from October 2016.